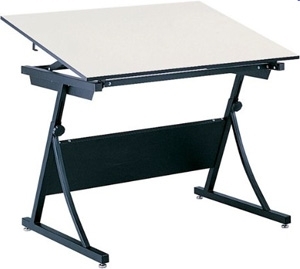 The PlanMaster Drafting Table provides the height and board angle adjustment of a traditional 4-post table. The height adjusts from 30" to 37" with a convenient spring-assisted mechanism. The top angle adjusts up to 50 degrees. The heavy-duty steel base comes in a durable black finish. 60"x37-1/2" board (Model 3948). Minor assembly is required.